Private hot tub? Check. Surrounded by forest? Check. Rustic aesthetic? Check. 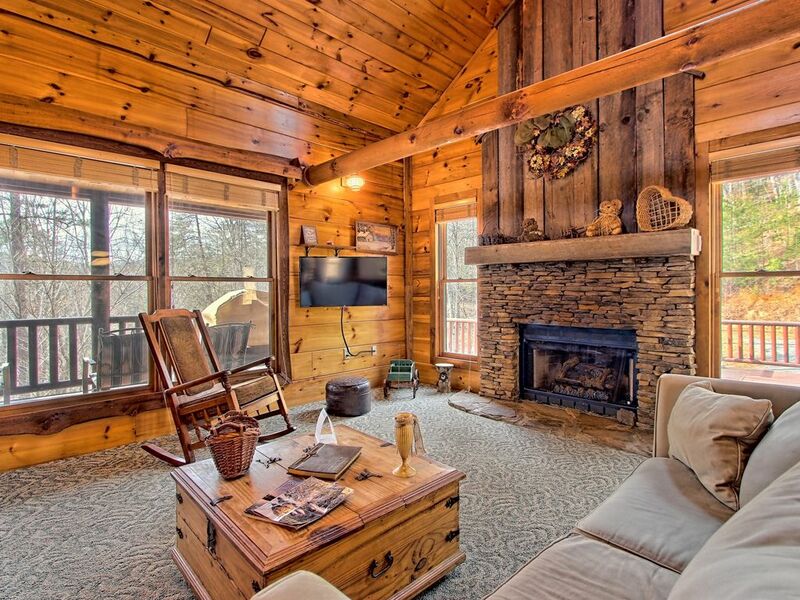 This cabin has everything you're looking for on your next Blue Ridge vacation. Whether you're grilling out on the deck or staying cozy inside under a pile of blankets, Best Kept Secret is here to make your mountain getaway a reality. While you're only six miles from town, this cabin has a distinctly secluded feel to it - perfect for anyone seeking a little peace and quiet. Take the short drive to spend an afternoon exploring Mercier Orchards, or take a ride on the Blue Ridge Scenic Railway. In the summer, rent a kayak or canoe and spend a restful afternoon paddling the tranquil, crystal clear waters of Lake Blue Ridge, nine miles east. Adorned with handsome knotty pine that stretches from the floorboards all the way up to the rafters, this charming log cabin enchants at every turn. Put together a home-cooked meal in the full kitchen, complete with all new appliances (as of December 2018), including a dishwasher and spacious kitchen island, then snuggle up in front of the river rock gas fireplace. Free WiFi keeps you connected to the outside world, and the private hot tub out on the deck is the perfect way to alleviate your stress while soaking up the gorgeous forest views. Reserve your spot at Best Kept Secret today! Parking Notes: This driveway is all gravel on a slight incline until parking level which is flat. There is enough parking area to accommodate the maximum number of guests. There was plenty of room for 5 people & quite comfortable. Good kitchen & appliances! This was the perfect place to stay for our first trip to blue ridge! The pictures provided so little justice to the actual property. It’s secluded enough to feel away from others but there’s neighbors close enough by to feel safe and you’re pretty close to a bunch of different restaurants and Grocery stores. The kitchen and new appliances are awesome and served their purpose, the beds are not the comfiest ever but they were no problem for any of us. The bath tub was definitely my favorite amenity! It truly is Blue Ridge’s Best Kept Secret! Stayed here for a short romantic getaway. The cabin was very roomy. Room enough for 8 if a couple of folks don't mind couching it. Location feels very secluded but only 10 minutes away from the city of Blue Ridge and chain grocery stores and restaurants. A few vineyards were close by as well. The driveway is kind of steep and could be difficult in a car with low ground clearance.